How do you find the best internet provider for you or the best internet package for your needs? Many people think that getting broadband packages at home for the first time or switching from their current broadband provider is difficult, but it doesn't have to be. At uSwitch.com, we show you all our best internet package deals, displayed with all the key features highlighted so that you can choose our best internet provider and broadband package quickly and easily. We also include a “price details” button so you can see a breakdown of the costs associated with each internet package — such as line rental, offer cost and regular price — to help you make an informed decision. To find the best internet package for you, you can filter all of our deals according to popularity, speed, download allowance, contract length or price. Broadband availability: Very few areas of the UK have access to every broadband package on the market. Enter your postcode into our broadband postcode checker to find out which internet packages are available in your area. Type of connection: The UK has ADSL, cable and mobile broadband, each of which has its own pros and cons. You can find out more information below. Most home broadband packages require an active BT landline in order to operate. This type of broadband is called ADSL broadband. If you have an active BT line, you can either choose broadband packages that offer standard ADSL, offered by the majority of internet providers in the UK, or ADSL2, which is faster but less widely available. Alternatively, you can switch your BT landline to your new ISP's landline service and get inclusive calls as offered in broadband packages by top broadband providers like TalkTalk and Sky, among others. 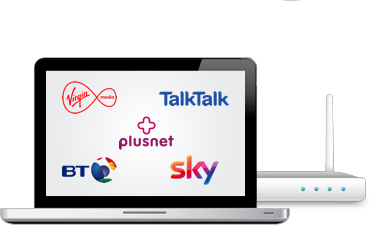 Cable broadband is available from fibre-optic broadband provider Virgin Media, Plusnet, TalkTalk, Sky, John Lewis and BT's Infinity service. Cable broadband is similar to ADSL broadband but is delivered through fibre-optic cables instead of BT telephone lines. Cable broadband is also much faster than ADSL broadband and provides UK subscribers with speeds of up to 330Mbps, depending upon your area and provider. Compare cable broadband packages here. Whilst they may offer the cheapest broadband service, one thing traditional broadband internet providers can't do is give you reliable internet on the go. Mobile broadband packages run on 3G and 4G mobile phone networks and therefore do not require a landline or cable. Mobile broadband is perhaps best suited to people looking for greater flexibility in their communications and who need to get online while they're on the move, including abroad. 4G is a newer mobile broadband technology and offers much, much faster connection speeds than 3G; however, a 3G connection is much more widely available. Compare mobile broadband deals here. Free tech goodies from BT and Virgin Media and one of the UK's cheapest broadband offers are among our best deals of the week. As of April 1st, broadband and phone customers are entitled to automatically receive compensation for issues with their service. Sky TV and broadband users can expect to see their bills increase Monday as a range of price increases come into effect.